I wanted to let you all know about an upcoming event that I am unfortunately not able to attend this year. I look forward to the Case Western Reserve University book sale every year and try to make a festive day out of it. My friend C. joined me last year, and we spent a delightful afternoon/early evening hanging in Cleveland Heights. I’ve also been known to treat myself to a lunch on the garden patio at Guarino’s in Little Italy, just me, a plate of pasta, and my new purchases. The CWRU book sale is gigantic. It literally fills up the entire gymnasium and is extremely well-organized. 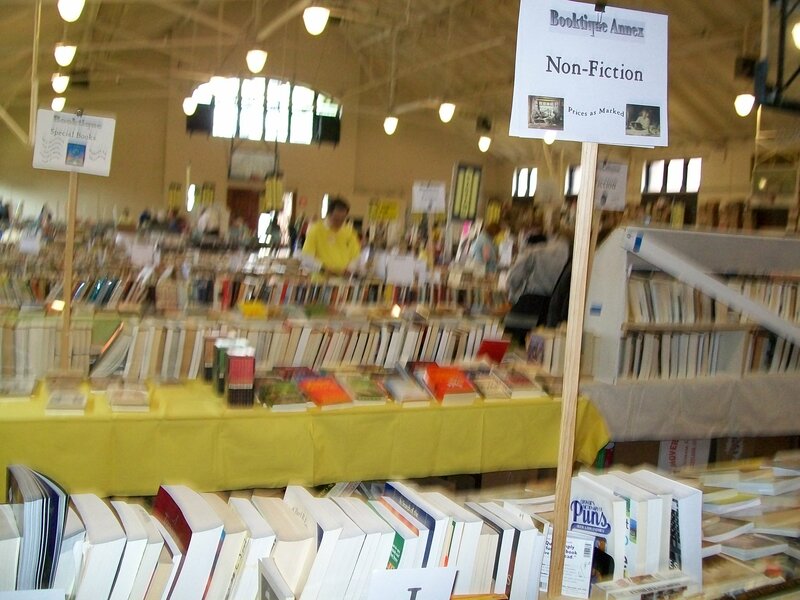 The books are divided into genres, and each genre gets its own section and own check-out help who mark down your purchases for that section on the form you get when you walk in. Once you have your fill of books you head to the front to pay for your books at the main check-out. I particularly enjoy the music section and the paperbacks in the back, but I also browse the cookbooks, history books, and German books. The rare editions and coffee table books are always interesting. In the past I’ve found a rare German dictionary set for a song, an ECG self-assessment program, and started my Les Roberts collection. Last year I scored 12 Vienna Masters Series CDs for $1 each that rounded off my collection of classical music that I started in 1989 (with only one duplicate, which I gave my father) in addition to a ton of paperbacks and some books on World War II and the art of spycraft. I guarantee that there are sections for every single taste. 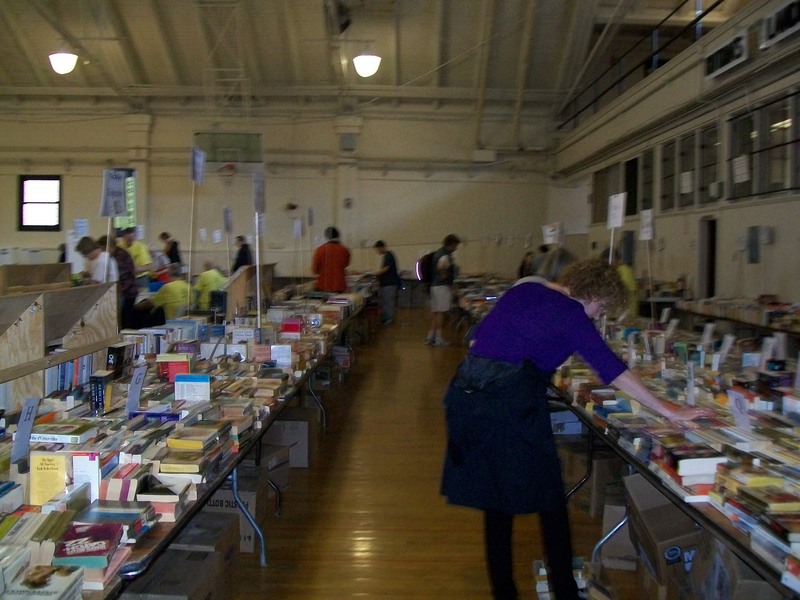 The Book Sale is being held this year from June 2-5. It is open Saturday from 10 a.m. – 12 p.m. for the preview price of $20 (this attracts mostly collectors and the truly zealous) and admission is free from 12 p.m. – 5 p.m. It is open Sunday and Monday from 12 p.m. – 5 p.m. and Tuesday from 10 a.m. – 1 p.m. Prices are reduced on Monday, and Tuesday is “Box Day” – $5/box. C. and I met at the Mad Greek parking lot, so we decided to enjoy a nice meal there as well. The patio had just opened for the season and it was a gorgeous day, so we sat outside. 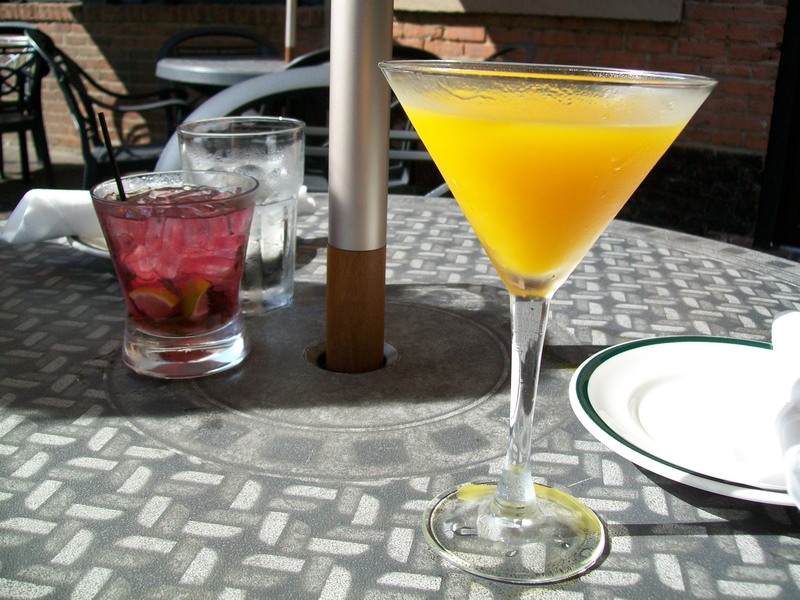 The servers brought our delicious drinks first, which we enjoyed in the sun. I ordered a Mango Madness and Caroline ordered the blueberry mojito. Both were very refreshing and potent. The server soon brought us our samosas, which we split, and our entrees (vegetarian Indian food for her and the Island of Minos Stir Fry for me). We enjoyed the delicious food and chatted about the book sale and our purchases. It was a delightful afternoon. So mark the dates in your calendar. If you love books this is one sale that you simply can’t miss! Add a trip to one of the local restaurants afterwards and you’ve got a quintessential Cleveland day that rocks!